When I was a six-maybe-seven-year-old my dad bought me a bb gun. It was the kind that required you to pull the stock away from the barrel and push it back again to force air into the chamber. 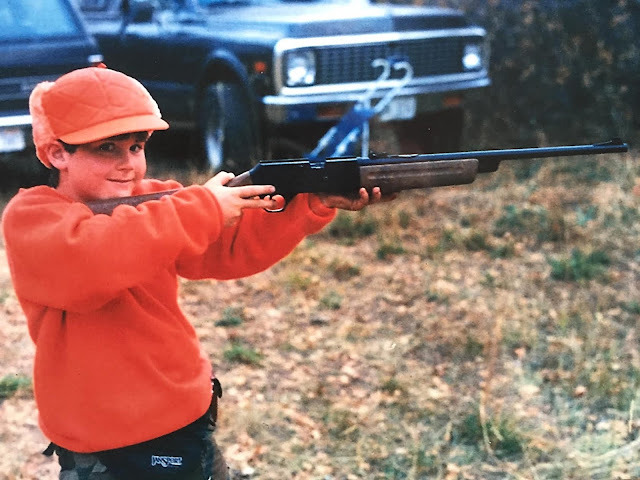 I could pump it about ten times before it got too difficult for my six-maybe-seven-year-old arms, at which point I knew that when I took the safety off, aimed it, and pulled the trigger a tiny metal ball would come out the tip of the barrel fast enough to breach the side of a tin can. We lived in a town-home duplex at the time and there were no places within walking distance for my dad to take me shooting. Instead he filled a cardboard box with old pillows, propped it against the inside of our garage door, instituted a three pump rule, and taught me how to shoot in our garage/bb gun shooting range. My dad had other guns, too. He had a 30 ot 6 deer hunting rifle, a shot gun, and (my favorite) a World War II era pump action, 10 shot .22 rifle. It had been his father's. Someday it was going to be mine. On October 1, 2015 a kid walked into a college class room in Oregon and executed ten people, including himself. He left one kid alive telling him that he had two requirements for him to be able to leave with his life. He had to tell everyone what happened, and he had to watch his friends die. In Boy Scouts I learned more about firearms. I learned how to set up and manage a range. I practiced with a muzzle loader until I could shoot the blade of an ax head, split the ball, and crack the two clay pigeons propped gently on either side of the secured blade. It’s not hard, really. As long as you hit the blade the musket balls are usually soft enough to break in two. It’s more of a parlor trick than a skill. But it impressed people more than burying multiple .22 shots in a circle the size of a dime, which at 13 was actually a lot harder to do. When I was 13 my friend James took a shotgun into his room and used it to end his life. I carried the American Flag at his funeral. I wore my Boy Scout uniform and white gloves. When I was 14 my parents divorced and I went through a really rough patch. My dad moved out of the house and into a nearby apartment. The apartment had a little storage closet attached to it and one night while my dad was away, someone (or multiple someones) shut themselves in the closet and cut a hole into my dad’s apartment. They stole his camera. They stole some cash he had stashed in his room. They stole his dad’s .22 rifle. The hole into my dad’s one-bedroom apartment from the storage closet was at the foot of the couch. The couch doubled as my bed when, after the divorce, I spent my weekends there. The first night I stayed there after the robbery I spent the bulk of the night staring into the black hole in the drywall, crying about my grandfather’s rifle. I never met my grandpa. He died shortly before I was born. He fought in World War II and was stationed in Northern Africa. When I held that rifle my dad would tell me how much it reminded him of his dad. Of how his dad would lay with him and teach him to line up the sights. About how his dad taught him to squeeze, not pull the trigger. Breathe in. Breathe out. Breathe in. Hold it. On November 27, 2015 Robert Dear walked into a Planned Parenthood with at least one gun. Over the next hour he shot and killed a police officer and two civilians. Nine others, five police officers and four civilians were also shot, but survived. The shooter's motives have not been released but one source has quoted him as saying "No more baby parts" as he was being arrested. In the months following my parents’ divorce, I started to rebel, push back, and test the boundaries of my new family structure. I started skipping school and smoking pot. I hung out with the wrong group of kids, and loved the feeling of always being on the edge of trouble. Obviously, my parents hated it. On a Tuesday in 9th Grade my whole group of friends went out behind the school to smoke weed. I stayed behind for some reason that I've since forgotten. They all got caught, expelled, and I was left to myself. This doesn’t have a lot to do with guns except that after all my friends got expelled I started to come out of my funk. I got back involved with school and started writing for the school newspaper. My grades came back up. My relationship with my parents started to mend. One day I came home from school to my dad’s house (he had since moved out of the apartment with the hole in the wall) and found a brand new Ruger 10 shot .22 rifle laying on my bed. It was more than a gift. It meant my dad trusted me again. According to the authorities, the shooter in Oregon had 13 different firearms. He left two pistols, four rifles and one shotgun at home and brought five pistols and one rifle with him to Umpqua Community College. The makes and models of the firearms have not been released. I didn’t fight her on it. I just closed my eyes and thought about laying in the dirt with my dad and shooting cans. I’d lock my guns up. I wouldn’t leave them loaded. Guns aren’t evil. People can be. I saved the fight for another day. The fight never came. When we bought our home I purchased a sturdy safe from my dad and promised that we would only buy ammo as needed for sport. If our kids accidentally found the key and accidentally opened the safe all they would accidentally find would be a few expensive clubs. A few weeks ago I got home and went to the safe where my guns live. I unlocked it and pulled out my .22. It has a stainless steel barrel and a black composite stock. The clip pops out from just behind the trigger loop. It is a small black cube with a place to slide tiny .22 caliber bullets. I thought about how someday I'd to take my daughter up into the Uinta Mountains where we’d find a steady log and space out 5-6 Pepsi cans across the top of it. I would inspect the area behind them for large rocks that might cause ricochets then pace out a reasonable distance for a kid to learn to shoot. I’d clear an area for us to lay down. She, like I was at her age, is too small to shoot standing. I'd have her lie down with the rifle and position it in her arms, teach her to line up the sight. Teach her how to breathe. I’d hear her laugh when the can leapt into the air. I'd tell her "good job." I put the empty clip back in the rifle, and held it tightly in my hands. This is my gun. It is the gun my dad gave me. I'm not a "nut." I'm just a normal guy. I’m not really worried about the government coming for me, and I don’t personally think having a gun in the house makes it any safer, but I understand why people love their guns. I love mine. I feel like I understand, at least partially, the complicated relationship we have with guns. Sometimes I still think about my grandfather’s .22. The police never found it. I worry that whoever took it didn’t love it the way my father did. I worry that they looked at it and saw a weapon to point at other people. Now every time I hear about another shooting on the news, I don’t picture the shooter with whatever semi-automatic rifle they purchased legally at a gun show. I picture them with my WWII-era 10 shot, pump action .22 rifle. I don’t know what the answers are. I don’t know if legislation will work. I don’t know if research will help. I don’t know. Virginia Tech - 33 dead. Aurora, Colorado Movie Theater - 12 dead. This week a husband and wife walked into a community center that helps people with disabilities and gunned down 14 people. At some point before going on this rampage they dropped off their six-month-old daughter at their parents house. If it were possible, I would give back every day in the woods with my dad. I would forsake every future day in the mountains with my kids and every Pepsi can flying off the log and into the brush. I'd let them all go, without hesitation, if it would give just one of those parents their kid back. How do we fix this? How can we make this stop? How can I help? Where do I start? I'm really asking. Please join the conversion in the comments here, or over on the Ask Your Dad Facebook Page. We as a people need to spend more time with this kind of conversation, with acknowledgement of what connects with people, on multiple sides of a conflict. There's no shouting here, no derision or name-calling. Just an honest, personal life of experience paired with a need for things to change. Laying out all the cards on the table, asking questions, and appreciating compromise and sacrifice, is what we need to do, and you've expressed this really well. Thank you. John, this is absolutely most eloquent, well thought, well spoken, and well reasoned insight I have yet to hear from a gun owner given our current state of insanity in the nation. It seems that if we are to have any hope - and I honestly feel any hope whatsoever - that it will have to come with nothing short of a complete repeal of the 2nd amendment. From there, a serious discussion regarding the public health, and if any public use of firearms can be reasonably justified. It seems that if, and this is a pretty massive long shot here (no pun intended), the decision can be made with a clear conscience to allow some segment of the American population to legally operate (not own) firearms again, that it may well be only under the strict control of professionals, in fully controlled environments. I simply cannot see any other possible means of appealing to those who - like you - have honest, and endearing memories and experiences shooting. It's an incredible statistic, to think that we have become so accustomed, so numbed, and so indifferent to the loss of 30,000+ human beings in this country every single year to gun violence, that we hardly pay the latest article with a body count any attention on the second page of the newspaper. Yet, fly a plane into a building or two, kill a [paltry] 3,000 people, and we fundamentally change our airline industry and add massive inconvenience, delay and billions in expenses, as well as going to war in TWO countries, killing thousands more of our own military personnel and hundreds of thousands of foreign citizens half a world away without hesitation or thought. ...and we continue to do absolutely n-o-t-h-i-n-g. Thank you so very much for your thoughts. And allowing me to express some of mine - although nowhere near as well stated as your own. My experience with guns is not the same as yours, obviously, but it's similar. I, too, am at a loss for what to do about the epidemic -- and it is an epidemic -- of gun violence in our great nation. Thanks for writing this. You may not have the answers, but experiences like yours are essential to the conversation. I am a gun owner. Very few people know that. I have a shot gun that was my Opa's and my adopted grandfather's service rifle from the Korean war. I keep them because of who gave them to me. They are sentimental as your firearms are. But I live in Canada. I have a licence to own my firearms. They are double locked. I have no ammunition in the house. In Canada we have the right to firearms but our regulations and restrictions are tight. And our gun violence is more than significantly lower. I'd say astronomically lower. Rules don't mean you cannot have things - just that you need to be educated and responsible about them. The US could make significant changes that would not have much of an effect on gun owners like yourself but would make it much harder for the widespread violence to occur. Hi John! This message comes from Europe - I accidentally discovered your blog a couple of years ago and I've been following you ever since. So in this discussion I'm an observer. In my country you need a license to buy a gun, which is preceded by a bunch of certificates (on your mental health, among others) and a full background check by your local police department. Even if you acquire it, you are only allowed to use your gun under very special circumstances, i.e. only for whatever reason your license was issued. You can't simply carry it around in the boot of your car. My boyfriend's father has guns in their home, because he used to hunt. Now that he's too old for the sport, they keep them locked and never get them out. They wouldn’t consider getting them out even despite they live in a most secluded spot (as secluded as you can get in Europe). The reason is simple: according to the law, if someone enters your home and you kill them, you find yourself in court facing manslaughter charges anyway. Where am I going with this? To simply demonstrate that it’s a matter of mentality. Guns are not easily accessible and they are regarded both by the people and the State as something dangerous which should be handled with care – because let’s face it, they are dangerous. Do the reasons which made the 2nd amendment a reasonable thing back then apply today? Do you need your right to bear arms to be protected? Are you in danger if it’s not? I understand the attachment with something that links you with your father and your grandfather. But I’m sure that people like you are more than able to find ways to substitute these links with new ones. And I also think that the change has to come from inside, from reasonable and sensitive people who love and own guns, but are willing to give them up if this can help things. It might take years to change the law, and even more years to change the people’s mentality – but if it means that your children and grandchildren will live in a safer world, it will probably be worth it. My husband sent a message with a funny comedy segment from Jim Jefferies to me, his sister and her husband. It was about gun control. It has been blocked on YouTube because of copyright. Here is a different link. https://www.youtube.com/watch?v=0rR9IaXH1M0 I think you can find the whole thing on Netflix. I wouldn't watch it with the kids around. We had a laugh and we totally agree. The only point he didn't hit was hunting. I'm from the South and my family hunts. My father never hunted for sport. We never had a deer head on the well, but we ate venison, duck and yes even squirrel (I didn't like the squirrel). I get where you are coming from. I wish we could find an answer. Your post is very honest and touching. Perhaps Dads could bond with their sons/children around something that doesn't involve killing and danger. Teach them how to use tools, build a tree house, etc. It's the bonding that is important, not the object used. Thanks for this post, very well done. I've been chewing over how to handle guns with my kids, and while I'm no closer to the answer I do think that having conversations and opinions like the ones you and the readers here have expressed are important. It is not often that the simple, satisfying, non-harmful side of owning and operating firearms is portrayed so neatly. My current plan is to use what I learned from my dad and the Boy Scouts to build a foundation of respect and appreciation for the inherent dangers of guns. My desire is that education and experience will de-mystify the concept and give my family a means to properly respect the right to own and use a firearm. My son loved BB guns growing up – this most exciting gift for him.We are a hunting family so you know we have those same BB guns for our kids. We like for them to get comfortable using the BB gun that way we can move them up to a real gun eventually and they can go hunting for deer and hog with us.